Crime, drugs, and gangs, what is the first thing that pops into your head when you think of these things? I bet you don’t think that immigration has any connection to the crime rates, but according to cis.org the 1970s and 1980s saw crime rates rise along with immigration levels. Loose border laws lead to increased crime rates such as drugs, and gangs. Drugs have caused numerous amount of problems in the United States , and around the world. The DEA says that in 2010 there were 30,922 arrests, just in the United States! According to the PEW research group, Hispanics make up 40 percent of federal prison population, but only contributed 13 percent of the country population. California’s prison system’s illegal immigrant population is 13 percent. This 13 percent is about 20,864 people, at $44,563 per prisoner per year, this cost the taxpayers $1 billion per year! Another 7.7 billion is payed by taxpayers to educate illegal immigrant, and 1.4 billion on health care, so using them for cheap labor, really isn’t so cheap when you look at it this way. Another reason we should have more selective border laws is that Many Hispanic immigrants are involved in gangs. National Gang Center.gov says law enforcement agencies report that a greater percentage of Hispanic/ Latino, and African-American/Black gang members compared with other ethnicities. The most recent statistics provided by law enforcement, are that 50 percent Hispanic/Latino gang members, 32 percent African-American/Black gang members, 10 percent Caucasian gang members, and 8 percent other race/ethnicity. 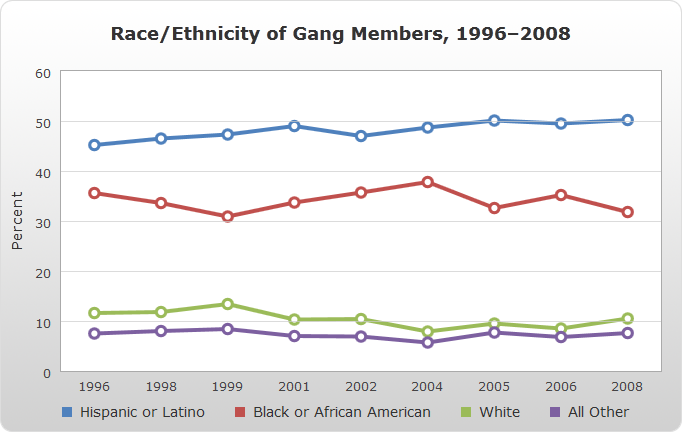 In all types of areas from big cities to rural counties Hispanic, and African-American dominate documented gang members. Having more strict border laws will conclude in lower crime rates, in areas such as drugs and gangs. According to a staff report of the House Committee on Homeland Security “Not all illegal aliens are crossing into the United States to find work. Law enforcement officials indicate that there are individuals coming across the border who are forced to leave their home countries and seeking refuge in the United States.” Our open border laws are opening doors not only to immigrants wanting to come for better opportunities, but also higher crime rates, more drugs, and more populated, and powerful gangs. Los estaouidenses tienen que crear leyes mas estrictos. Hay que discutir con todo los representante. Los leyes tienen que estar justo. Hay que pensar con los Mexicanos. Hay que hablar a el gobierno. Los Mexicanos tienen que seguir las leyes. I like how you included pictures and lots of evidence. Your blog was very good and very informative. I really liked it.